I’m currently setting up the next release from PolyMarket Press, and absolutely thrilled with the work that photographer Ricardo Acevedo has prepared for it. Based in Austin Texas, Ricardo has worked with a variety of artists, musicians, filmmakers and performers. His sense of color, texture, light and form is honed to a fine degree of sharp perception that he shares with viewers. 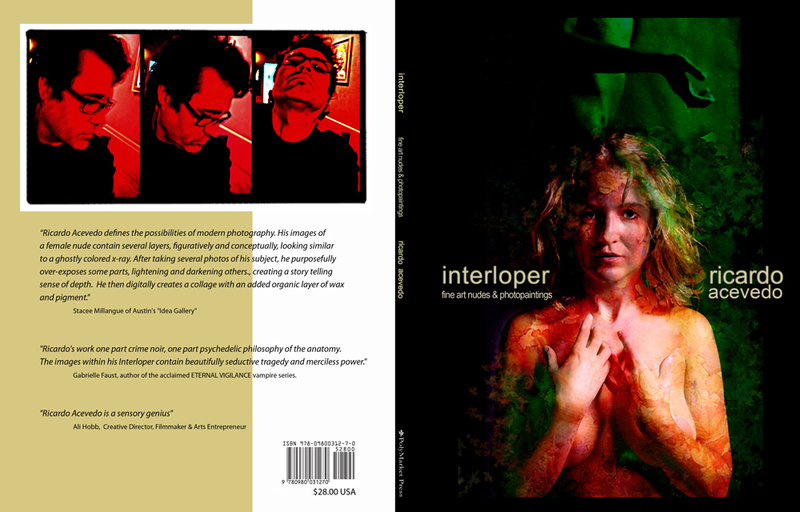 Titled “Interloper: fine art nudes and photopaintings” this full color book presents 57 beautiful images accompanied by excerpts from Ricardo’s written work. Ricardo’s work begins with his camera and models, but does not end with the individual pictures that result. He takes multiple photographs and works with Adobe Photoshop to create fantastically rich, luminous images that evoke unseen depths exposed fresh to our gaze in the moment of view. His loving aesthetic is rendered anew in each shot and rises above the pale restraints of “prettiness” to show beauty in its many forms. Shown above is a rough draft of the back, spine and front of this 118 page book. The projected debut of this book is July 31, and while signed copies will be available exclusively through the artist, the book will also be sold online through Amazon.com and Barnes & Noble. Do check back at this site for updates on its release.